Want to make sure your henna tattoo stains the darkest? Follow these steps to keep your design looking sharp! If you are serious about wanting a dark long lasting design, keep the henna on for at least 4 hours or longer if you can. The longer the better. Once applied the design can be coated with sugar and lemon paste and wrapped tightly and worn overnight. We always coat the design with a sugar and lemon paste while it is drying but you can apply more coats at home on your own. After sufficient time, gently pick or scrape the henna off with the back of a butter knife, credit card or fingernail, DO NOT wash or rinse off unless you decide you want a lighter design. 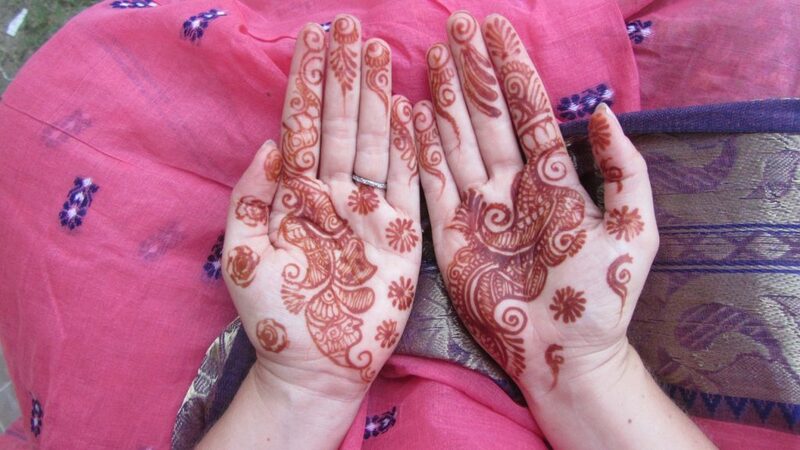 After you remove the dried henna, apply a natural oil (olive, coconut, shea butter, etc) or Tiger Balm to the design. It will appear very light at first but will darken over the next 72 hours. Try not to use soap or water on the area for at least 24 hours, this allows the henna to completely absorb into the skin. Before bathing apply oil, natural lotion or tiger balm to the area to prevent fading and to keep your design looking great! If you need to remove your tattoo early you can use a sugar and oil mixture to exfoliate the area. Now offering UV Henna and Glow in the Dark Henna, contact us for details.